The smallest of chunks can become something much bigger with careful construction and a bit of planning. 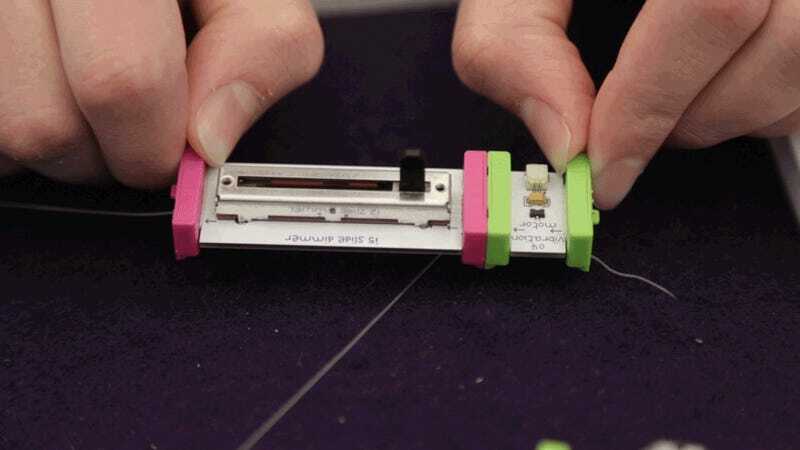 LittleBits—an awesome little building tool that sits somewhere on the spectrum between Lego and arduino, incorporating the best parts of both—is showing off that potential big time in the windows of NYC's MoMa Design Stores this month. We spent some time with the blocks and their creator yesterday. And we didn't want to leave. 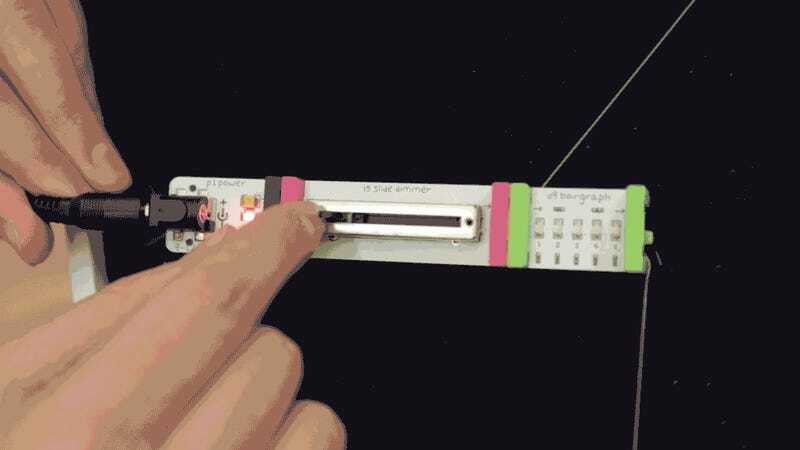 LittleBits are bite-sized, self-contained little electronic modules that snap together magnetically to create all kinds of electronic circuits. Each piece is self-contained, no exposed wires, no connections that need soldering, nothing to screw up. And with that tool box of tiny plastic logic gates, switches, pressure sensors, motors, LEDs, and whathaveyou, anyone—electronically inclined or not—can build mesmerizing machinations. These MoMa displays prove it. 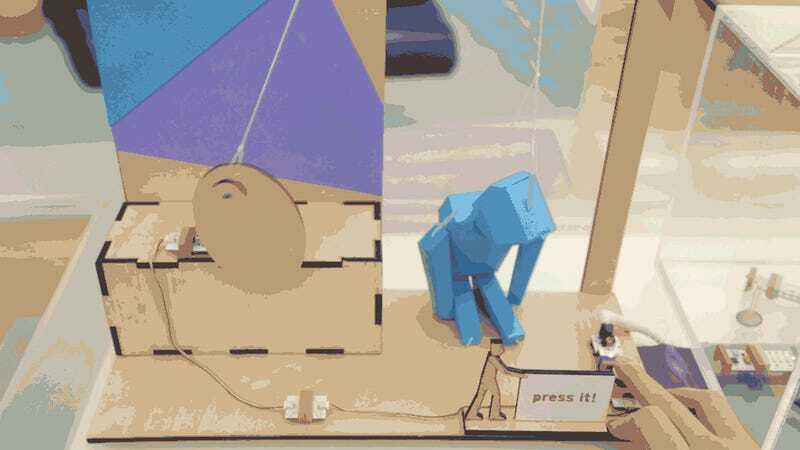 We talked with littleBits Design Lead Jordi Borràs and one of the window display's designers Ryan Dunn about the hulking kinetic statues and the electronics that pushed them along. Powered entirely by littleBit units, the moving sculptures illustrate how even these tiny little blocks can scale up into something far more striking, and how the littleBits themselves can take care of all the techie, electronic framework leaving the designer to just design. Or the kid to play. Or the tinkerer to tinker. The displays celebrate littleBit's introduction to the MoMa store, where pieces can be bought in a variety of bungles or just piece by piece. And the displays will stay in store windows at both the uptown and downtown locations for a couple of months. Chances are you're not going to build any four-foot tall paper-craft sculptures out of littleBits yourself, but the potential's there; you just have to want to. But no one would blame you if you settled for something smaller-scale.